Marianne Pistilli, PA is a physician assistant with over 11 years of experience in cosmetic and medical dermatology. She is a member of the Society of Dermatology Physician Assistants and the American Society for Laser Medicine and Surgery. Marianne has extensive experience performing cosmetic laser procedures, including scar resurfacing, skin rejuvenation, micro laser peels, tattoo removal, vein treatments for face and body, dark spot correction and laser hair removal. 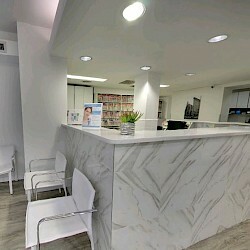 She also specializes in all injectable treatments such as Botox, Restylane, Juvaderm, Sculptra and Belotero. In addition, Marianne has many years of experience conducting medical skin procedures for her patients, including skin cancer screenings, biopsies, evaluation and treatment of rashes, acne, rosacea, psoriasis and other conditions. Marianne graduated in 2003 from Weill Cornell Medical College. She also holds an MBA from New York University and a B.S. in Accounting from St. John’s University. Marianne is an instructor in dermatology at the Physician Assistant program at Weill Cornell Medical College.